New Mexico State University awarded a posthumous bachelor’s degree in business administration at the December 2017 commencement ceremony. Jon Canfield walked on behalf of his brother, Daniel, who died in 2017. “He was a wonderful son and brother and will be remembered for his loving and kind heart and his fierce love for his family,” says their mother, Laurie. Daniel was planning on a career in either tax preparation or tutoring and wanted to live and work in Colorado. Daniel had traveled to Colorado Springs shortly before graduation to talk with tax preparation firms about employment. On his way home, he was killed in a highway accident outside of Colorado Springs. Jon, who also accepted his bachelor’s degree in criminal justice at the ceremony, told his family that accepting his brother’s diploma was a very emotional experience. Daniel had a disability, and Laurie says it made school difficult for him. 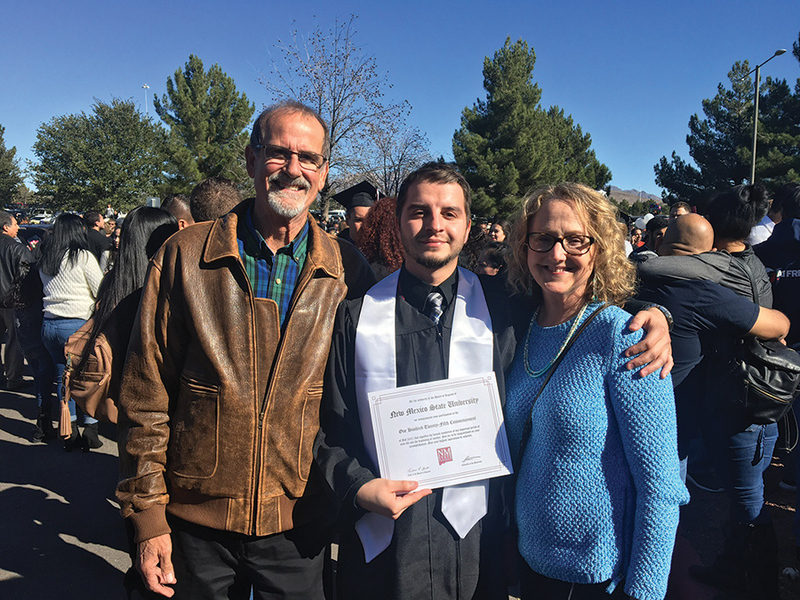 Jon Canfield (center), who earned his bachelor’s degree in December and accepted a posthumous degree for his brother, Daniel, celebrated commencement with his parents, David and Laurie Canfield.